Salamanders - Jen Lamb, Ph.D. The photos below were taken either in the field or in the lab, and most of the photos of larvae were taken in the lab. Any measurement marks represent centimeters unless otherwise noted in the photo. All photos are of individuals from Mississippi, unless otherwise noted. Plethodontidae is our most diverse family of salamanders, and it contains species that span a wide range of habitats, including leaf-litter dwelling and permanently aquatic species. As indicated in the title, these salamanders have no lungs, so they acquire Oxygen solely through cutaneous respiration. Another interesting synapomorphy (shared, derived character state) is their ability to project their tongue, an adaptation for capturing prey. Mississippi has, or is known to have had, about 17 different species or subspecies of plethodontids (MDWFP herp list), and the greatest diversity of these occur in the Northeastern corner of the state. Click on the pic of the plethodontid and you'll see navegation arrows show up in the right hand corner. Unlike the plethodontids, these salamanders have lungs. Many species, like the 5 species in Mississippi, breed in ephemeral or semi-permanent wetlands. Because these habitats are temporary, adults migrate to and from breeding habitats. This often requires that they cross roads, which can result in high rates of mortality on heavily trafficked roads (see the graphic photo on the right). Fortunately, concerned citizens and biologists often try to assist these salamanders and other amphibians as they cross these roads, either by closing roads during peak migration periods, installing tunnels under the roads, or by manually helping individuals across. 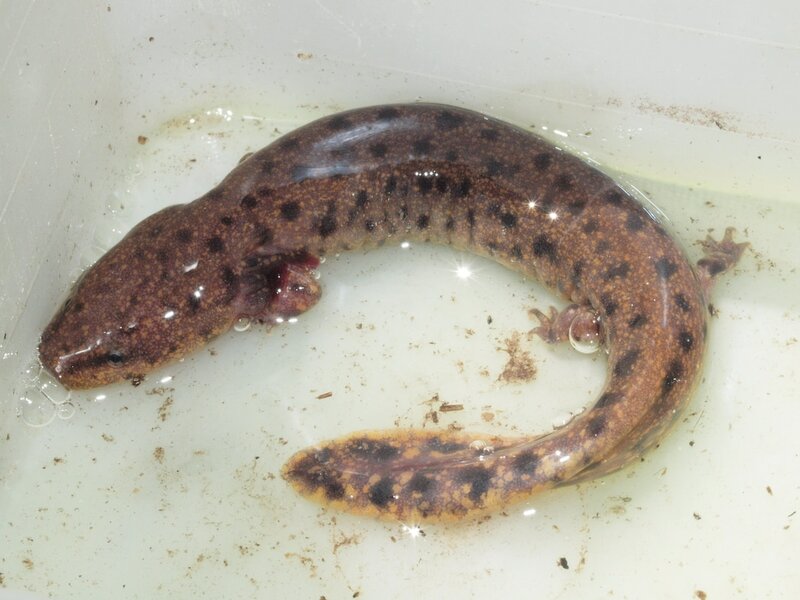 A larval lesser siren (Siren intermedia) found in May 2014 in South MS. Lesser siren (Siren intermedia). This is the only species of siren in Mississippi. In March and April 2016, myself, Grover J. 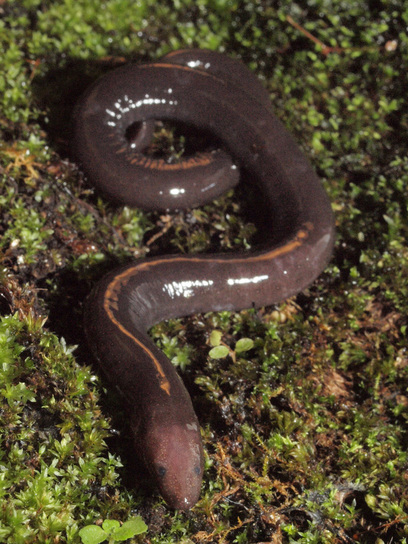 Brown & Cybil Huntzinger (USM PhD students), and some folks from TNC were lucky enough to stumble upon four one-toed amphiumas (Amphiuma pholeter) across two visits to the same site in South Mississippi. The photos above and to the right are of the same individual (found by GJB). One-toed amphiumas are an endangered species in Mississippi, elusive elsewhere in their range, and only one other individual had ever been found in our state. Our find has been published as a Geographic Distribution note in Herpetological Review (Brown & Lamb, 2016). Two different two-toed amphiumas (Amphiuma means) caught in Alabama during a herpetology conference. The newts in Mississippi belong in the genus Notophthalmus. These newts have an interesting life cycle. Adults are aquatic and lay eggs in the water, often attaching them to submerged vegetation. The eggs hatch in to larval salamanders, and these larvae can sometimes metamorphose in to a temporary terrestrial stage, called an eft. The eft has drier, more granular skin, and efts can be bright red or orange (though they are usually a dull brown in MS). This color serves to warn predators of the toxins contained in the skin of the eft. After a while, the eft moves back in to the water and changes to an aquatic adult. In some populations, often in southern populations or populations at lower elevations, the eft stage is skipped and larvae transform directly in to aquatic adults. Newts in the United States could be at risk to a new, deadly fungal pathogen called Batrachochytrium salamandrivorans (Bsal). Bsal is a type of chytrid fungus that is likely native to Asia and has spread to Europe via the pet trade. As of May 2016, Bsal has not been detected in wild populations in the US, but the USGS and others are currently conducting surveys to determine whether it has been introduced in to our salamander populations. 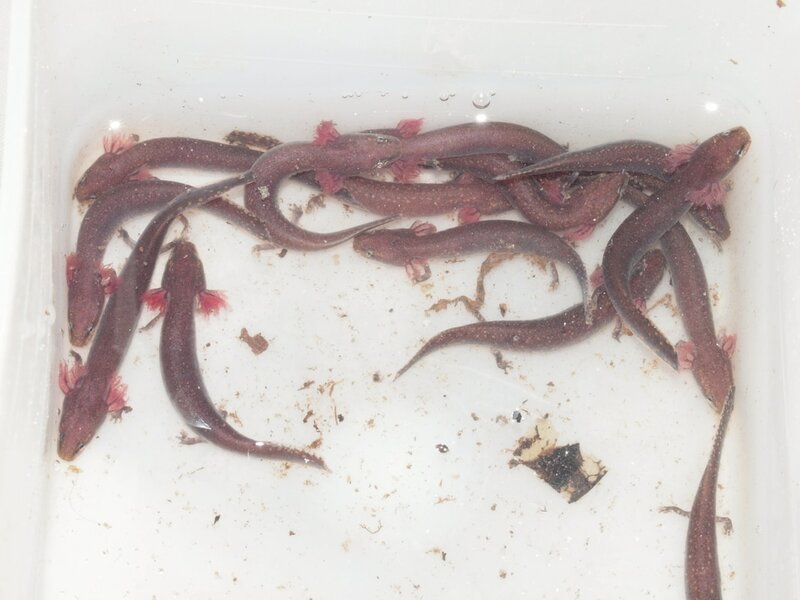 Mudpuppies and Waterdogs (Family Proteidae). A gravid (egg bearing) female Gulf Coast waterdog from the Chickasawhay River in the Pascagoula River Drainage, MS.
Larvae and juveniles of Gulf Coast waterdogs are often abundant in leaf litter packs. These critters can take years to reach sexual maturity.